One of the first dinner parties I planned and executed on my own was a surprise birthday bash for a friend, featuring fondue for eight people. As we were all high school students in semi-rural Kentucky, the menu was neither exotic nor very challenging. But I had the right equipment at my fingertips: color-coded long handled fondue forks, a heavy pot suspended on metal frame set over a flickering Sterno container and ceramic fondue plates my parents had purchased in the 1960s sporting a deep red majolica print and divided sections. I was relieved that everyone seemed to have a great time, and nothing caught fire that wasn’t supposed to. A few years later, I learned about the charming European custom of kissing the person on your right if you lost your morsel off the fondue fork into the pot. I wish I’d known that tidbit when I was planning seating for that high school party and planted myself to the right of a certain crush-worthy guy. Since those halcyon days of big hair and acid-washed jeans, I’ve added a bit of variety to the menu: hearty bread, pickled veggies, charcuterie and subbing in unusual cheese combinations. A lingering Christmas Eve fondue feast has become a family tradition since my kids were toddlers: They pitch in during the day to shred mountains of cheese and help assemble platters of dippable bites for later. After Christmas Eve Mass, we return home for a lazy and comforting meal that’s pretty much ready to go; I enjoy a glass of wine while tending to the cheese melting, and we’re dipping our forks at the table in under half an hour. And when cooking for a crowd, I’m still a big believer that fondue may be the ultimate cocktail party food for facilitating conversation among guests, pre-calculated smooching aside. 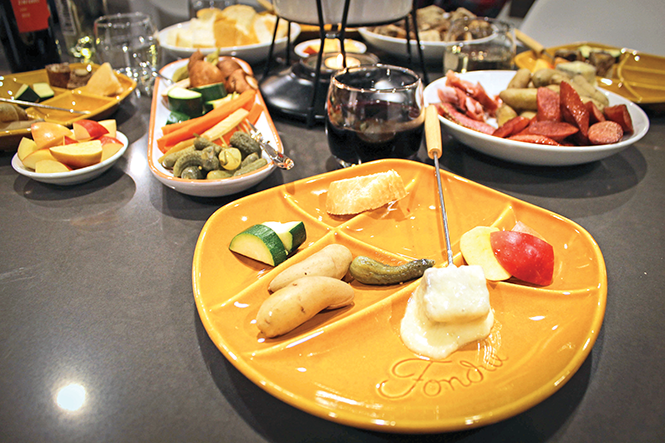 The Swiss get credit for creating fondue using local cheese mixed with wine or other spirits and dipping in seasonal vegetables and day-old bread. Like most dishes with peasant roots, it is as simple as it is hearty and divine. But there’s always room for error. To get the scoop on optimal fondue results for any occasion, I checked in with one of Utah’s premiere cheese experts, Sheri Allen, whose long list of credentials includes being part of the first class of American Cheese Society sensory evaluators (and an ACS Certified Cheese Professional) and a member of the Guilde International des Fromagers. “Fondue is French for ‘melted,’ and classic fondue is made of Alpine-style cheeses melted with a dry white wine,” says Allen of the basics. 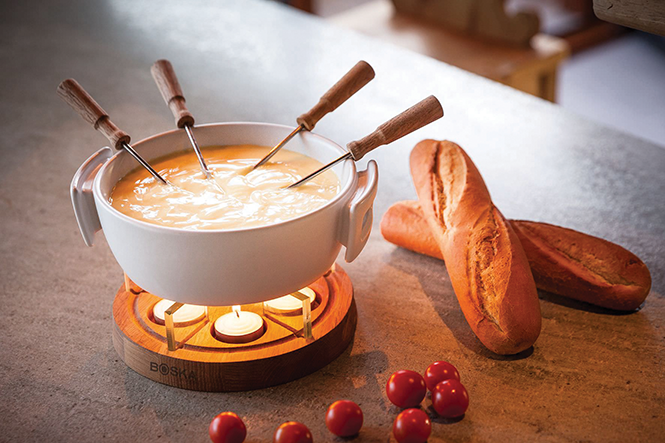 To take your fondue to the next level, she asserts that a good fondue requires the best cheese you can buy, traditionally Comté, Gruyère or Emmenthal. Picking a great cheese is just the foundation for fondue; the sky is the limit for subbing in beer or cider instead of wine, or for adding spicy or herbaceous elements. Allen also recommends thinking outside the box when it comes to selecting cheese, saying of one unusual meal, “I had fondue at Androuet in London using a blend of seasonal cheeses in the autumn that included English cheddars such as Lincolnshire Poacher and Stilton blue cheese.” Bold flavors push the boundaries of what’s considered a typical fondue. With the internet at our fingertips, it’s never been easier to source fondue recipes from a world of traditions as well as unique new combinations. Just keep in mind that making fondue is more of an experiment with ratios than a set recipe and go with the flow. Then cue up the 1960s lounge playlist, get the wine flowing and everyone will be dipping to that fondue groove in no time. Cheese expert Allen and I compared tips for optimal fondue results. Plan on about 7-8 ounces of cheese per person for a main course fondue. To get good consistency, toss grated cheeses with cornstarch; approximately 1 tablespoon of cornstarch for every half-pound of cheese (some recipes use flour instead). Temperature control is crucial. Use a stovetop-safe pot specifically made for fondue, or a double boiler over simmering water and transfer the melted cheese to a ceramic fondue pot. 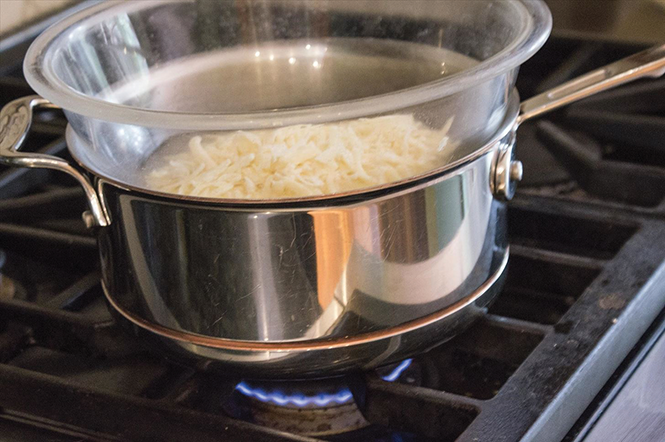 You can skip the stovetop altogether by using an electric set-up. 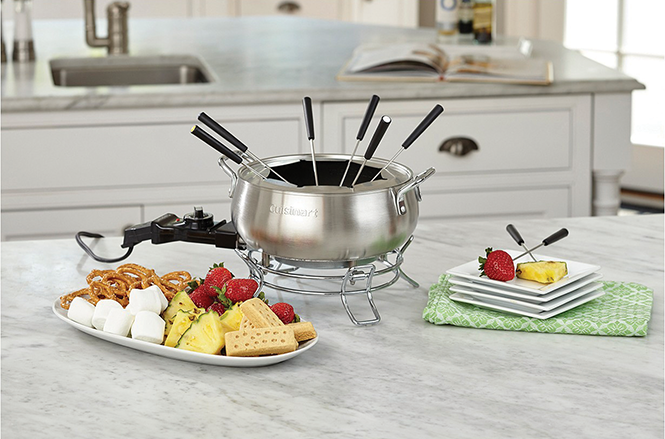 Allen’s pick: Cuisinart Fondue Pot. Rub the interior of the pot with the cut side of a garlic clove and discard it. For each pound of cheese, add approximately one cup of wine, beer, hard cider or other spirit (or apple cider for a no-alcohol version) to the pot. Heat over medium-low until steaming, just below a simmer. Turn the heat down to low and stir in the grated cheese a big handful at a time, completely melting between each new addition. Stir constantly to incorporate until all cheese is included. Keep stirring until the cheese sauce is uniform, glossy and smooth. Stir in about 1 tablespoon lemon juice and 1 tablespoon of kirsch or brandy per pound of cheese. Optional seasoning: fresh-grated nutmeg, thyme, rosemary, cracked pepper. Once the fondue is prepared and ready to serve, it is important to keep it on very low heat. Watch the heat source! A Sterno may be too powerful for your pot, so use a diffusing plate to step down the heat or substitute a candle. Add more liquid (wine, cider, etc.) during service if the cheese gets too thick. When you have finished the fondue, you will find a thin, golden, cheese crust called la religieuse (the nun) at the bottom of the pot. It resembles a tasty caramelized cheese crisp. A bonus treat for whoever’s doing cleanup! Fondue geeks note: Some very traditional Swiss recipes call for adding all ingredients to the pot at once and letting them sit for over an hour to meld flavors before heating to melt everything together in one step. For a larger dinner or cocktail party, set up stations for two kinds of cheese fondue, a bubbling copper pot of oil for meat fondue, another spot for miso broth or vegetable tempura for our vegan friends and, of course, chocolate fondue for dessert. Set stacks of little tapas plates at each station for guests to help themselves. With fire involved, it’s just a matter of safety to stay away from paper products of any sort; heavy cloth napkins are a must. The same goes for wardrobe choices: While caftans and droopy sleeves go beautifully with the party theme, they aren’t so attractive when covered with cheese. Or flames. For meat fondue, specifically designed hot-oil fondue pots are available at vintage stores and online. When choosing meats, just remember that the hot oil will sear foods, but it won’t “cook” them through, so avoid pork and poultry unless in pre-cooked sausages. Use top-grade beef cuts you would eat rare/medium-rare (such as sirloin), trim well and pre-cut into 1-inch cubes. Add quick-cooking shrimp or scallops for a surf-and-turf station. Chocolate fondue recipes abound, usually mixing melted chocolate with cream and brandy to make it smooth, served with fruit and firm pastry (such as pound cake) for dipping. Similar to preparing cheese fondue, using very low heat is crucial to avoid scorching. Chocolate expert Matt Caputo advises sourcing great raw materials: “Valrhona if you want something more classic (dark roast and vanilla) that won’t break the bank.” Or, use a more fruit-forward chocolate such as Utah-made Solstice, with several flavors available at Caputo’s in 2-pound bulk packs (his pick for fondue: Solstice Wasatch Blend). Great cheese is all about flavor and character. The complexity of European Alpine cheeses, for example, comes from the milk of cows grazing on the rich grass, herbs and flowers of Alpine pastures. And if you’ve ever been to the Alps, you know that these sturdy cows are treated with reverent celebrity, decorated with flower crowns and elaborately painted bells. In northern Utah, Rockhill Creamery (563 S. State St., Richmond, 435-258-1278, RockhillCheese.com) makes Alpine-style cheeses from the milk of six Brown Swiss cows that are almost as pampered as their European cousins. 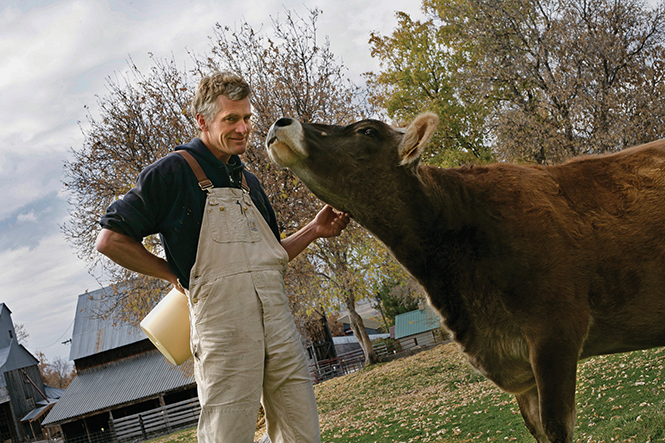 “Happy cows make delicious milk,” Rockhill founder Pete Schropp explains. 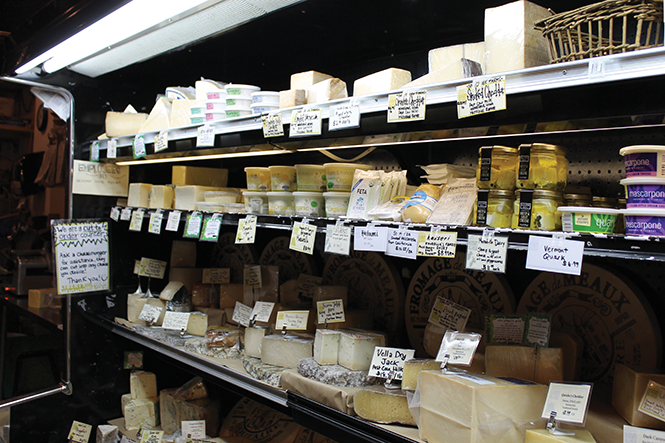 Co-owner Jennifer Hines uses the raw milk to hand-press wheels of their exceptional cheese. Many Swiss immigrants settled in Utah’s Cache Valley to replicate the climate and elevation of the Swiss Alps for cheese making; for many years, local Gossner Foods was the largest Swiss cheese producer in the world. 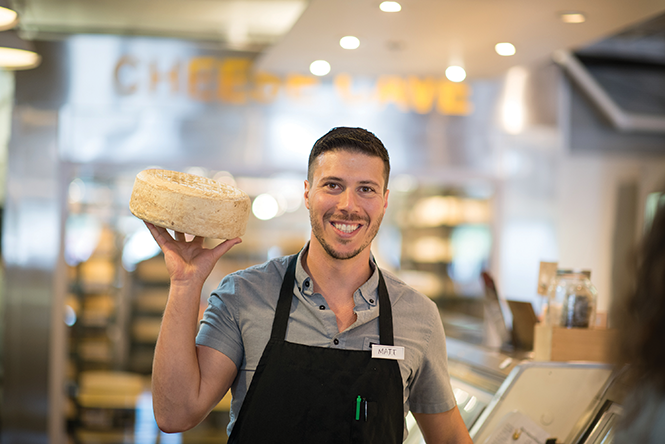 If a trip to the Alps (or even northern Utah) isn’t in your near future, we’re fortunate to have CCPs and knowledgeable cheesemongers happy to share their expertise all over the state. 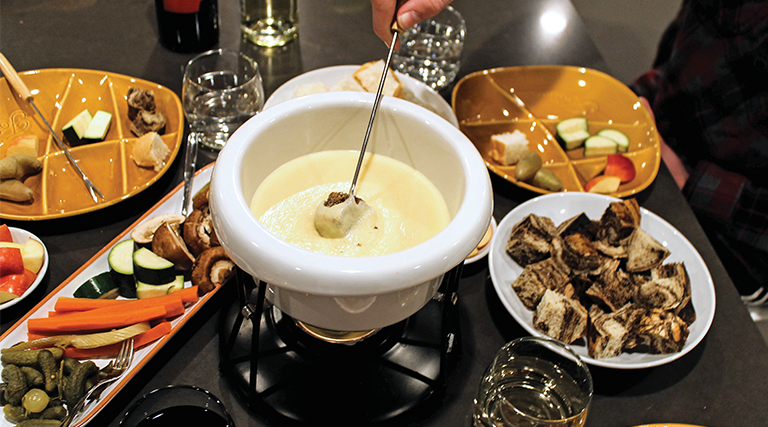 Here are suggestions for great fondue cheeses and where to find them. Classic Swiss fondue recipes call for moitié-moitié (half and half), equal parts Gruyère and vacherin. LHF cheesemonger Michelle Walker suggests Vacherin Fribourgeois. Traditional Italian fonduta that only uses one cheese, Aosta Fontina, with the rationale that a single cheese should be complex enough to be perfect. Caputo’s stocks a number of classic Gruyère options that can be pricey; try mixing in a stellar French Comté for great fondue results at a lower price point. Cheese expert Sheri Allen ([email protected]) conducts cheese education events all over the world and caters fondue parties around Utah. You’ll often find her behind an international selection of cheeses at Harmons Neighborhood Grocer (multiple locations, HarmonsGrocery.com). 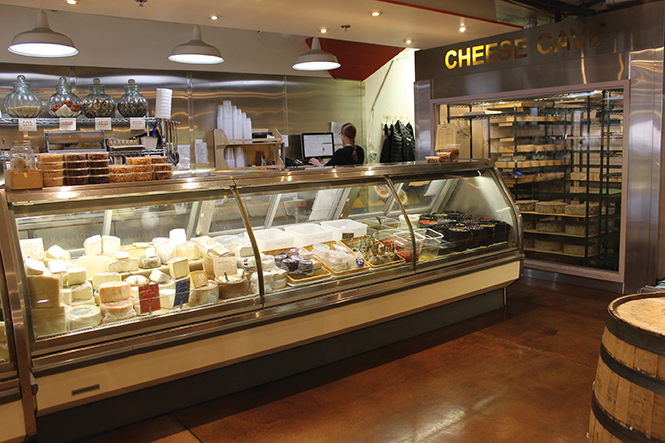 In fact, Harmons has an extensive cheese-education program, with the largest total number of CCP’s in the state. 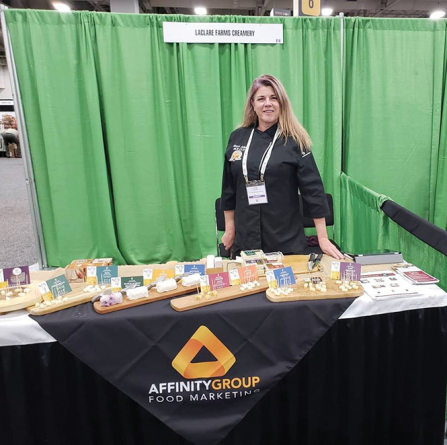 Allen is a fan of using Utah cheese in fondue, as well; “Rockhill’s Wasatch Mountain is inspired by Gruyère, or use their Boo Boo Baby Swiss.” She also recommends using Beehive Cheese cheddars with equal parts Alpine-style cheese for a hearty cheddar fondue. Heat the beer in the fondue pot to just steaming. Slowly stir in the cheese blend until smooth and thick. Turn down the heat and enjoy with cocktail smokies, corn chips, cubed ham, bread and apple wedges.